JD came on staff in January 2017. 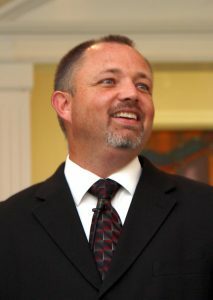 He had previously served as pastor at Union Baptist in Hannah, SC, and First Baptist Bulter, AL. He had also served as Youth Pastor at Lankford Memorial Baptist in Greensboro, NC, and First Baptist Butler. He was raised in Weaver, AL, and did his undergraduate work at the University of Mobile. He also has an M.Div. from Southeastern Baptist Theological Seminary. He is married to Brandi, and has two children (Kole and Jake). JD’s aim at FBC is to keep Jesus central in every aspect of church life.